In the early 1950s a number of dinghy sailors were actively cruising off the South Coast of England but could not find a sailing club to suit them as they did not wish to confine themselves to racing. One wrote a letter to Yachting Monthly in December 1952 complaining of this, signing off as ‘Clubless’. Eric Coleman, later to become President of the DCA until 1964, replied as ‘Lonehand’ to say that he liked the idea of an organization through which he could meet other enthusiasts, sail with them and exchange ideas on technical and safety matters. About a dozen people declared an interest and Eric invited them to a succession of four rallies. No one attended any of them, so he gave up the whole idea. 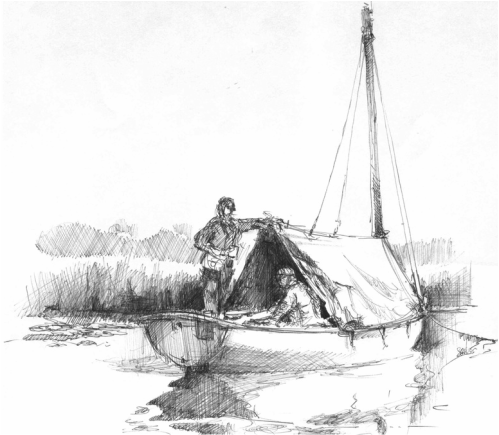 In January 1955 Michael Lawes of Lymington picked up a two year-old copy of Yachting Monthly in a doctor’s surgery while he was waiting to be inoculated before going abroad: he was planning to sail his dinghy to Malta! He read Eric’s letter, contacted him and urged him not to give up. Eric wrote again to Yachting Monthly in March 1955 and got a better response. Although the DCA had been imagined as a South Coast club – one suggestion for the name had been the Chichester Cruising Club – there was a lot of interest on the East Coast too and a certain Miss Joan Bentley, later to become Mrs Joan Abrams, proved to be more than capable of organizing a section there. So the DCA, with its thriving regional branches, was born. The inaugural meeting of the South Coast section took place on May 30th 1955 and that of the East Coast section on July 24th. The first rally was based on the Folly Inn, Medina River, Isle of Wight, on August 31st. The membership had risen to 75 and the subscription had been set at 2s/6d – two shillings and sixpence. To provide a channel for the exchange of information on all aspects of dinghy cruising and to enable enthusiasts to contact each other. By holding rallies, to enable enthusiasts to meet each other. To assist novices to take up dinghy cruising.